The well-being of YKK AP’s employees is a recurring theme in its Fundamental Behaviors that govern the company’s daily practice and bring its culture to life. As we head into 2018, employees recently took initiative to bring greater awareness to staff of the many existing wellness benefits the company has to offer. 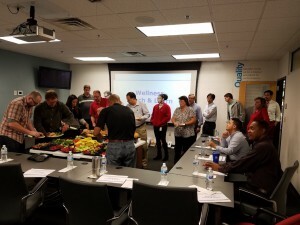 In mid-November, the employee-led wellness team held a workshop to discuss the existing program and launch new initiatives to add fun and fitness to employees’ daily lives. One of the most successful, ongoing initiatives is the company’s “Idea Challenge,” which has stirred up creativity among staff in the office to come up with out-of-the-box ideas to make wellness top of mind. A winning idea was to adopt a mile near YKK AP’s corporate headquarters in Austell, Ga. The new initiative will get employees up and moving on Saturday mornings while contributing to the health of its local environment. Another employee initiative – to stock its warehouse with bicycles, so that employees can cycle during their breaks, or even bike to lunch. As 2018 approaches, YKK AP’s employees have taken their health into their own hands and have ramped up the company’s wellness program – not just in preparation of the new year, but to keep wellness top of mind all year long.